If you’re looking for a more casual look to wear to an upcoming holiday event, try adding a festive scarf to an outfit you already love! 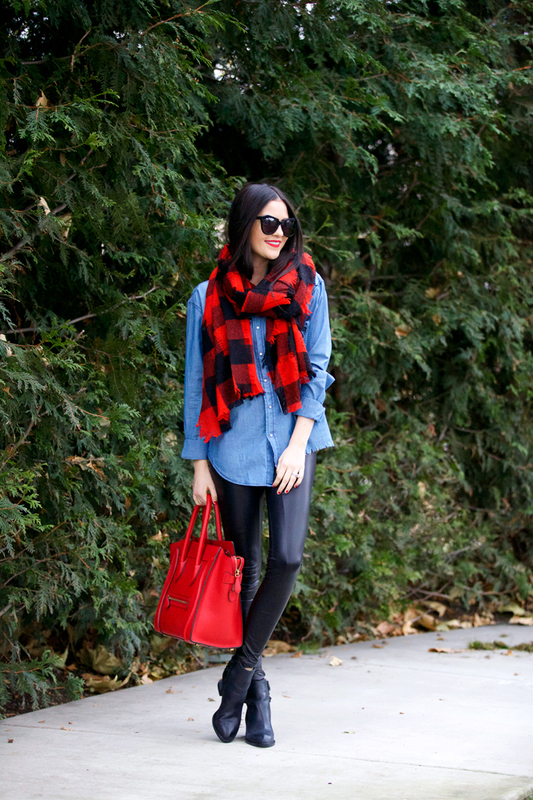 I found this buffalo check scarf from Shopbop and decided to pair it with a classic chambray top and some sleek leggings to create a more relaxed, easygoing look that’s still Christmasy. How are you creating more laid-back looks this holiday season?! I wore a similar outfit this week! Love it. Love the black and red combo… good look! Obsessed! Love this casual look with the pops of color! I love that red buffalo check print! It pairs nicely with your chambray top. Great look! 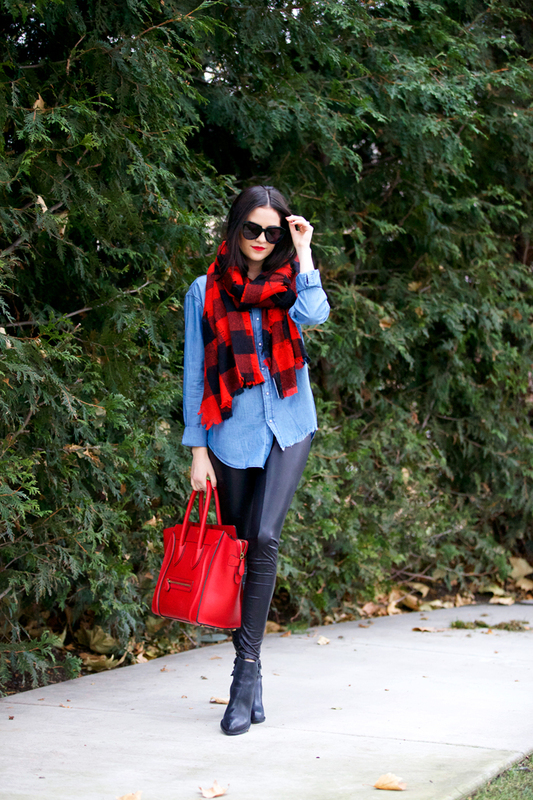 Love the chambray with the leather leggings, such a great look! those leggings fit you like a glove! I’m loveing all of your festive pops of red lately, and the pairing with your chambray top is so cute! Love the frayed hem! Beautiful scarf! Janica has a scarf post up today where you can get a similar scarf for half the price! Great minds think alike!! 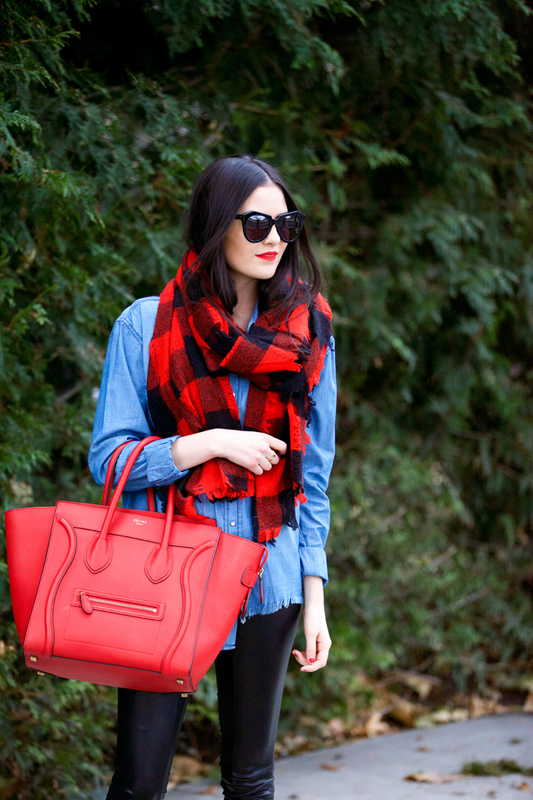 I love that buffalo check scarf! I’m in love with this gorgeous classic look!! It definitely is so festive and versatile for many events or daily holiday style!! Definitely going to duplicate this look. Thanks for all the great holiday style inspiration! Such a cute look! Love the leather leggings! Such a cozy look and pretty scarf! I love this ides! This scarf is really nice! Lovin’ the scarf, you looks so cute – as always! Have a great weekend! I saw this look on instagram last night, you look fab!! I love the leather effect of the leggings with such a casual top, looks perfect together! Love this buffalo check scarf, I’m mildly obsessed with this pattern this season! That scarf is so pretty and perfect for the holiday season! I love how it looks against the chambray shirt, great styling as always! I hope you have a wonderful weekend! Love this outfit! It’s simple but yet chic! Love your glasses! The shape is just so cool! Great combo! You look gorgeous as always! This outfit is so simple but really cute. 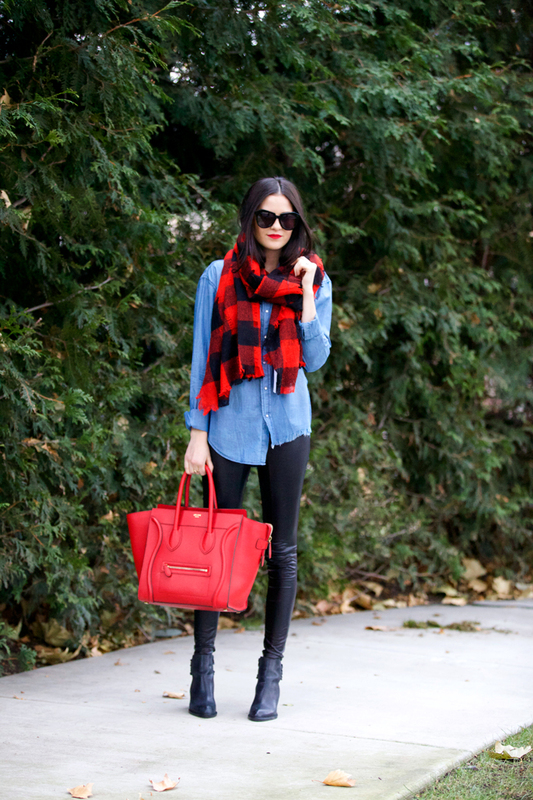 I’ve never thought about pairing a festive scarf with a simple chambray and black pants combo, love it! Love the oversized scarf! It goes so well with the chambray. Love the red! Makes it festive but in a subtle way. Love the colors of this look! You’re just stunning! Gorgeous and simple outfit! I love the lipstick. 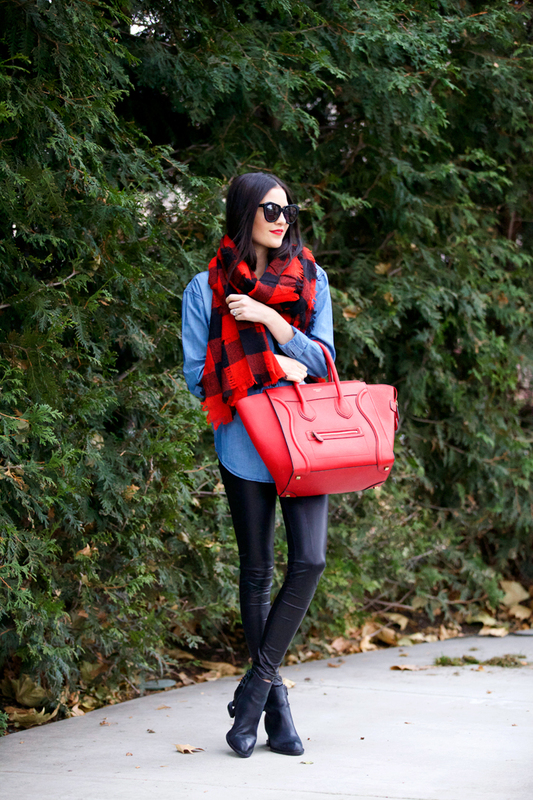 Love the pop of color with the scarf and bag! That bag is perfect! !